Last week we kicked off the 100 Acts of Kindness Project with our first challenge by Megan of Coffee Cups & Crayons. This week we received our second kindness challenge (issued by Kim from The Educators' Spin On It)! Today Valerie from Glittering Muffins is sharing about how her family shows kindness within their home. As we perform acts of kindness, one of the most important things we can remember is to focus on our own little sphere of influence (spouse, kids, parents, siblings) in addition to other people around us. Often it is easier to be kinder to the postman than it is to be kind to our child who just smeared tooth paste all over the bathroom mirror for the fourth time! Glittering Muffins is a blog filled with one family's adventures with glitter, crafts, and food! They host a fabulous Around the world in 12 Dishes series along with a fun series about Kids On the Go where they feature museums, zoos, parks, etc. They can also be found on Facebook, Pinterest, Twitter, and Google +... so go stop by! How's the kindness challenge going at your house this week? My favorite moments this week have occurred as I have watched my two older kids play nicely together again and again. They run in circles around the living room, build forts, have dance parties, and play trains. I have been loving the simple ways that they have been showing kindness to one another- sharing toys, saying sorry, helping each other pick things up, cheering for one another, asking for things in polite ways, and saying thank you (to name a few)! 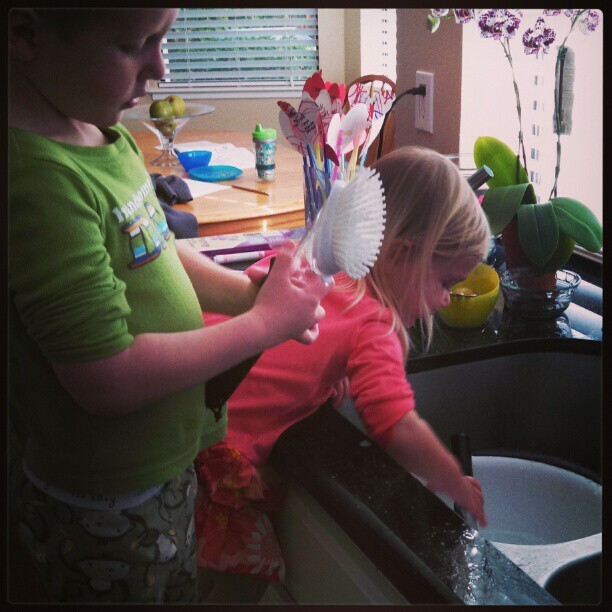 Today they were also kind and helped with scrubbing the dishes! What are simple ways that your kids show kindness to one another at home? Come share in the comments! By the way, have you chosen a book to give to someone for Week 2's kindness challenge? We are still deciding which one(s) to pick. We are helping to host a Book themed Baby Shower for my sister in law this weekend, so we are making her a LOVE books package with a baby book or two and some baby activities. My son wants to give her Baby Cakes ... so we just need to think of something to put with it! Wish us luck! My Usborne Reader is giving away two awesome book packages to two Toddler Approved readers as part of our Kindness Project. Head over to our Usborne Books Giveaway post to enter! I'm also sharing a sweet prize package when you sign up for BabbaCo's newsletter... which is filled with fun craft ideas, parenting tips, and kid friendly recipes... so make sure to stop by! I also shared a fun post yesterday with some ideas for beating winter boredom and the indoor blues. Getting siblings to be kind to each other! That I need to work on with my two younger kids!